Alan Perry has been involved in some of the largest and most complicated litigation matters in Mississippi. 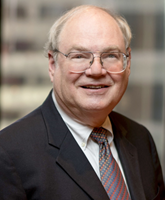 He has handled banking, securities, and antitrust cases, as well as matters involving business torts and statutory claims. With a background in accounting Alan is well-known for his financial law acumen and is often hired in litigation related to accounting and auditing matters, as well as other cases involving financial institutions. He also maintains an active practice providing advice to corporate boards. Alan has a national reputation. A Fellow in the American College of Trial Lawyers, he is listed in Chambers USA as a “Star Individual” in General Commercial Litigation and is ranked for Appellate Litigation. He has been listed in The Best Lawyers in America®annually since 1983, and is currently ranked in six areas, including Bet-the-Company Litigation, Commercial Litigation, and Corporate Governance Law. Alan has served as a member of the Standing Committee on Rules of Practice and Procedure of the Judicial Conference of the United States and as a member of the Visiting Committee of the Harvard Law School.